The 2015 Portland Timbers regular season kicks off on Saturday, March 7 at Providence Park. Don’t miss a second of the action getting stuck looking for a parking spot. Let TriMet get you to the game. Our MAX Blue and Red line trains drop you off across the street from Providence Park. Two regular service bus lines, Line 15-Belmont/NW 23rd and Line 20-Burnside/Stark, serve the stadium. The price of a 2 ½ hour ticket or Day Pass will be much cheaper than metered parking with event parking rates in effect nearby. Plan your trip there with TriMet’s online trip planner. Express buses also will run between downtown Portland and the stadium. TriMet will once again be running Timbers Express buses between downtown Portland and Providence Park. 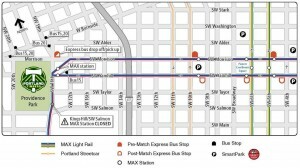 Catch the buses across from MAX stations at Mall/SW 5th Ave and Galleria/SW 10th Ave beginning about 90 minutes before a match. After the game, board express buses across from Providence Park’s main entrance on Morrison Street at 18th Ave. 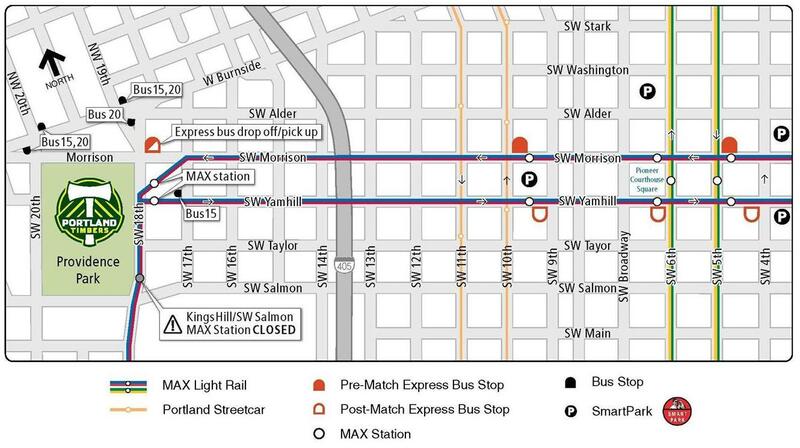 The buses will drop off at three MAX stations (Library/SW 9th Ave, Pioneer Square South and Mall/SW 4th Ave) to connect to parking garages and MAX Green/Yellow line trains. Standard fare is required on express buses. Extra MAX trains will be available, if needed, following matches to help get you on your way home. We remind everyone to pay attention and use caution around our trains and buses, as the crowds swell outside the stadium. Because of safety concerns, the nearby Kings Hill/SW Salmon St MAX platform will be closed two hours before game time. It will remain closed after matches until the crowd clears. And make sure you have your ticket to ride. Fares are required throughout the TriMet system on both buses and trains. Those without a valid fare face a $175 citation or exclusion from the system for up to 90 days. Buying your fare is easy with the free TriMet Tickets mobile app. Easily purchase and use tickets and passes instantly on your phone – anywhere, anytime. Just download the free app, register your debit/credit card in our secure system and you’re ready to buy, activate and go. Learn more at trimet.org/mobiletickets.